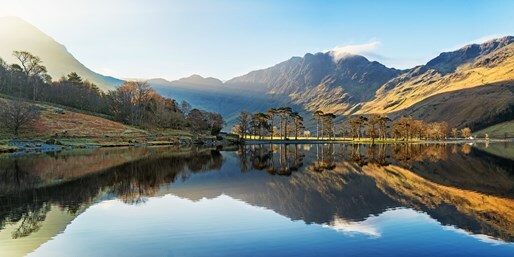 The Lake District is one of the most beautiful places in the UK, recently voted the most popular national park in the country, this mountainous region is a treat for walking enthusiasts and families alike. Described by Lonely Planet as ‘poetry in the hills’ and with so many different walks to choose from, it’s definitely worth dusting off your hiking boots for. This serene spot is nestled away from the often hustle and bustle of Lake Windermere. It’s a popular location for budding photographers thanks to its calm and quiet nature providing some of the best views in Britain. On this family-friendly route you are likely to find Herdwick sheep grazing and, if you go in spring, the Rannerale Knotts will be carpeted in bluebells. This route is also hugely popular for a dander in the evening. Of course, any walking guide for the Lake District wouldn’t be complete without a mention for what is considered to be one of the busiest stretches of water in the area. However, if you want to find a quieter spot, head to its western shore and discover a peaceful shore walk that’ll allow you to bask in its beauty. One of the most popular walks for those who head to the Lake District is the journey up Scafell Pike England’s highest mountain. This route is often used for those taking part in the national Three Peaks Challenge and is thought by many as being the hardest of the trio due to its necessity of a technical approach because of a lack of a ‘tourist path’. Once you reach the summit, the panoramic views overlooking the Lakeland fells make it all worthwhile, but it’s important to note that higher parts of this walk can prove tricky in poor weather conditions. Let’s throw you right in at the deep end. This route, albeit tough, offers unrivalled views when you reach its peak. With the Helvellyn hike once voted as Britain’s favourite walk, this added extra includes more dramatic and challenging ridges for those who would like to push themselves that little bit further. With panoramic views like no other when you reach the summit of Helvellyn, this route is a must for any keen walker. It’s now possible to walk the entire circuit of this lake after a new route was created following the floods in 2015. However, if 20 miles sounds too much for you, there are shorter options that are clearly signposted. On the route, you will find artworks, including the Wainwright Sitting Stone and the Dorothy Gate. Plus, no visit to Ullswater is complete if you haven’t went sailing on what many describe as the most beautiful lake in the area. With so many options available, you could keep coming back to the Lakes and take part in a new route each time. Its beauty is like no other and it has something for everyone, no matter your age or walking ability. So, be sure to use the routes provided above to dip your toe into the vast pool – or lakes if you may – of options available to you in the heart of Cumbria. Safe travels!